You’d think Hillary Clinton would be hiding down her rat hole, as she seeks extradition. However, since gracing now President Trump at his inauguration, she’s been emboldened. In what may be the ultimate “three strikes,” some speculate that Hillary Clinton is considering one more run for President. However it her approach that has people scratching their heads. Could Hillary Clinton be considering Hollywood as her vehicle? After all, a reality show certainly worked well for America’s new president. Author Ed Klein wrote recently that the former secretary of state is open to the idea. According to Klein, Clinton gathered with a group of friends in her Washington, D.C. home. She raised a glass of wine and said: ‘I’ll be back’ – and delivered the line in an Arnold Schwarzenegger ‘Terminator’ accent. Of course Clinton might take care when it comes to putting herself in front of viewers every day. Recall that Real Housewives of New Jersey’star Teresa Giudice found herself behind bars after her fraudulent behavior was highlighted…on camera. Clinton may find it difficult to hide a server in a bathroom closet with so many prying eyes. 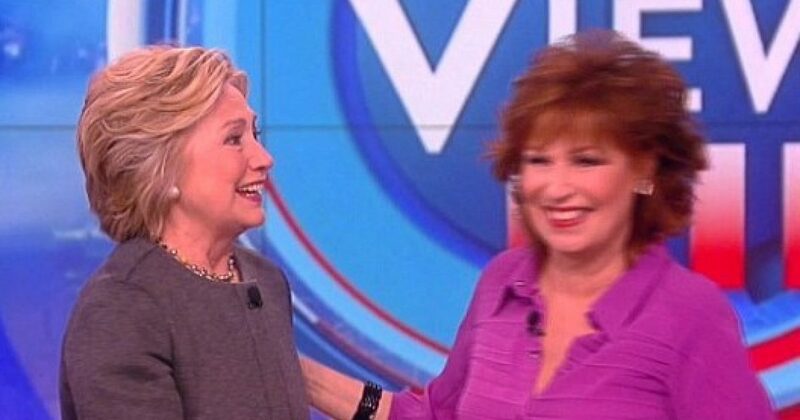 If “Real Crooks” doesn’t work, then Clinton could become the second oldest hag in TV, behind Joy Behar, by joining The [Ugly] View? Regardless, Clinton has certainly been at ease on the talk show circuit where handlers “soften” her up, and sand down those hard edges with a concrete blaster. To be back you must leave. To quote an old country song: It’s hard to say goodbye, when you’re sittin’ on my face. Making another run for the White House would put Clinton at 73, before she can even try again. She has to wait to see how Trump does, and all indicators are Trump is a rock star. The show would require that Clinton give up any attempt to become the Mayor of New York City. Further, it would also cut into her freelance work as a public speaker, where children must pay $2,700 just to ask Clinton a question. One thing is for sure, the Clintons need to make another move soon. With her so-called non-profit under scrutiny, Clinton might want to keep all of her options open. How about a reprise of The Beverly Hillbillies? No, Jed Clampett’s family was likable. I would watch a reality show of The Clintons. The problem is after one season, the rest of the seasons would have to be filmed from prison. But, if things go well and it’s “third time’s the charm” for Clinton, a well-scripted reality show could propel her to new heights, and that possible third shot at the prize. That would be historic. As would her third loss.